The most viewed NBA Finals in history just happened this year, as LeBron James and his Cleveland Cavaliers became the first team in history to come back from a 3 games to 1 deficit to beat the greatest regular season team in history, the Golden State Warriors. LeBron also became the first player to average more points, rebounds, and assists than anyone on both teams, as he unanimously won the Finals MVP. Yet despite all this, his salary for this year was $22.9 million. Sure this is still a lot, but to put this in perspective, Michael Jordan made $33.1 million in the 1997-1998 NBA season, which as of 2016 is the highest ever NBA salary. But that alone is not as astonishing as when we take into account inflation, which would be just under $50 million!! This is more than double what LeBron James' salary. This becomes even more unbelievable when you take into account the NBA signing a new gigantic multi-billion dollar TV deal, and the NBA's popularity becoming global. 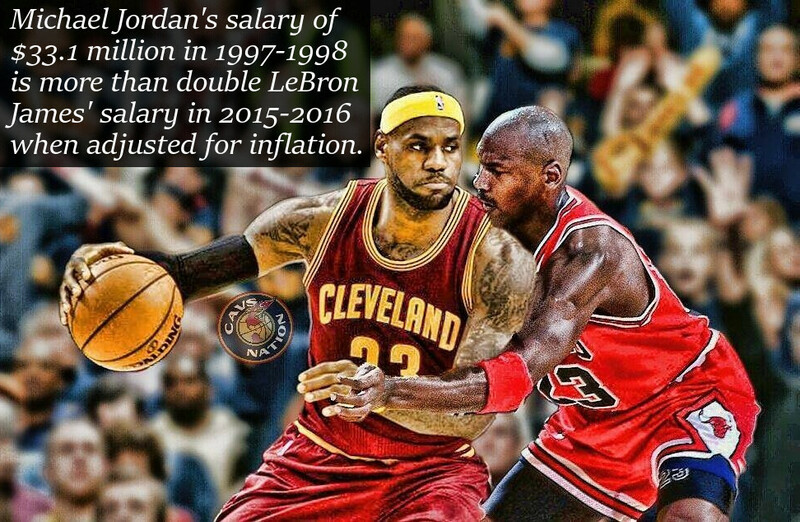 So to put this in perspective, LeBron James, might just be the most underpaid athlete of all time! Subscribe for Daily Money Facts!